Win an Etrian Odyssey II Soundtrack! You see a really big and scary dragon in the woods. You are scared. You turn to your party members Greg, Robert, and Liz and are like “Uh, I’m really not sure what to do in this situation. I think we should run.” Greg is like “OK” and Liz agrees, but Robert is stupid and decides we should fight the dragon because we have many fighting abilities to beat him. Robert casts “Find cheap deal in Best Buy ad”. “Find cheap deal in Best Buy ad” misses Dragon A.
Greg casts “That girl looks hot except her [insert body part] is messed up”. Greg’s attack fails, Dragon A is male. Mike puts on “Old lacrosse shirt”. Mike gains 1 armor. Liz drinks a wine! Liz gains 50 HP. Liz’s status changes to slightly drunk. Dragon A crushes you all. I only make fun of Robert because he never reads this. Actually, I think this is a good start to my real life RPG starring all my friends. 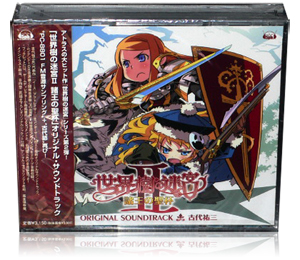 Continue reading Win an Etrian Odyssey II Soundtrack! Posted on May 7, 2008 May 9, 2008 Author MikeCategories DS, RPGTags Atlus, DS, Etrian Odyssey 2, Etrian Odyssey II, Soundtrack10 Comments on Win an Etrian Odyssey II Soundtrack! Honestly, this might be one of the worst “trailers” ever, but it’s Etrian Odyssey 2 so it’s OK. I don’t know why the first Etrian Odyssey wasn’t more popular, it’s a really great RPG. It’s tough at first, but once you get into it it’s great. Regardless, Etrian Odyssey 2 is going to be awesome. The trailer looks exactly like the start of the first one, where the soldier asks you to map out the first floor…I imagine the Japanese is saying something like “Suddenly you see a soldier wearing a crazy mask with no apparent eye holes appear out of the forest.” There’s another trailer after the link, but if you can’t read Japanese I wouldn’t bother.